This green and orange colored bounce house rental is great for a lower budget party also fits well with the boxing glove rental add-on. This unit has some wear and fading but is still in perfectly good working order. Price is lower due to age. 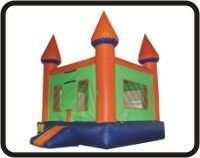 Please check out www.moonbouncekc.com to confirm your price and book a rental.